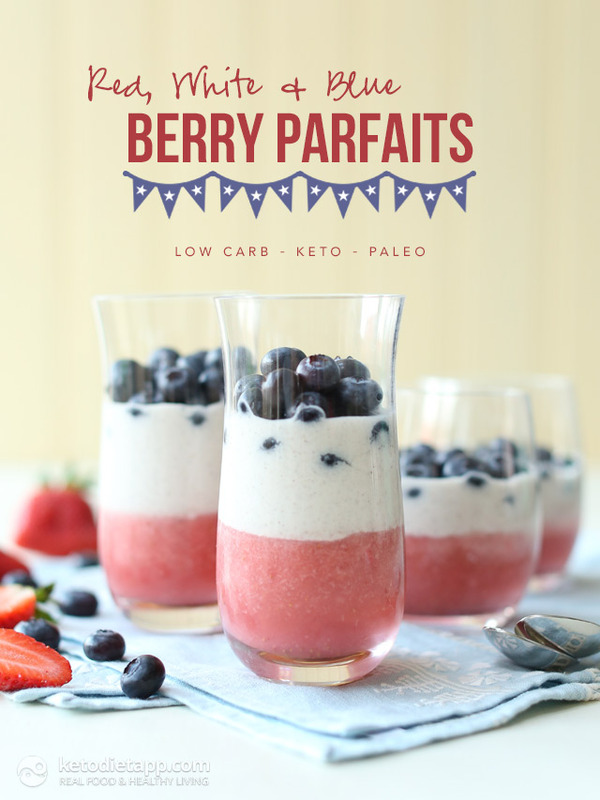 Here&apos;s a low-carb treat for my American friends! 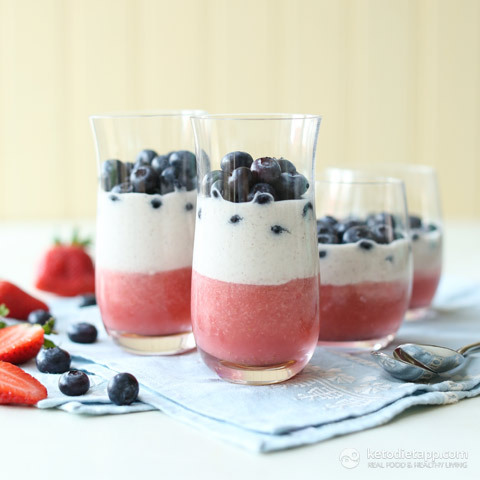 These patriotic parfaits are the perfect quick-prep dessert for the upcoming Fourth of July celebrations. 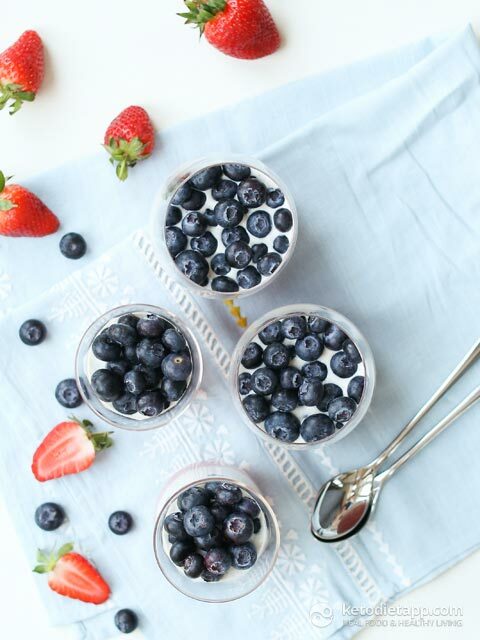 The red strawberry layer is topped with vanilla coconut cream and finished with fresh blueberries. 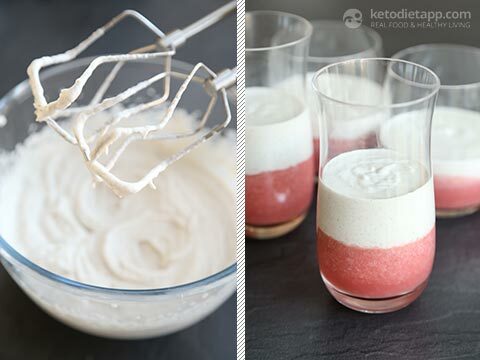 This treat is dairy-free but if you can eat dairy, you can substitute the coconut cream and coconut milk with an equal amount of whipped cream. It&apos;s naturally sweet and you can even avoid using any sweeteners. Tip: To get the net carbs per serving down to 7.4 g, use an equal amount of blackberries instead of blueberries. Start by preparing the red layer. 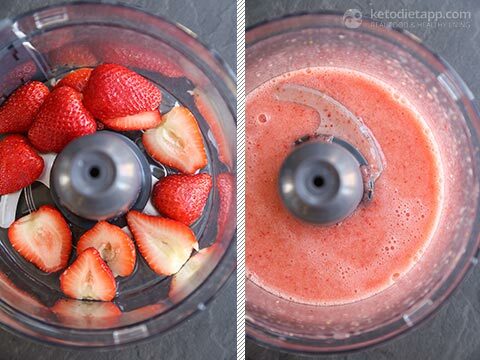 Place the strawberries with 1/4 cup (60 ml) of water into a blender or a food processor and pulse until smooth. Pour the strawberry puree into a small sauce pan and add stevia. Mix the gelatine with the remaining water, and then pour into the sauce pan with the pureed strawberries. Heat gently until warm, and then take off the heat. 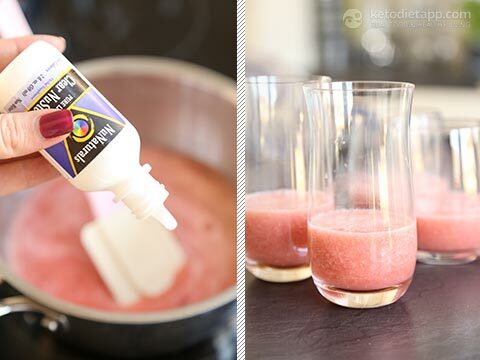 Divide the strawberry mixture between 4 jars or glasses, and then, place in the fridge for an hour or until set. When the red strawberry layer is set, prepare the white coconut cream layer. 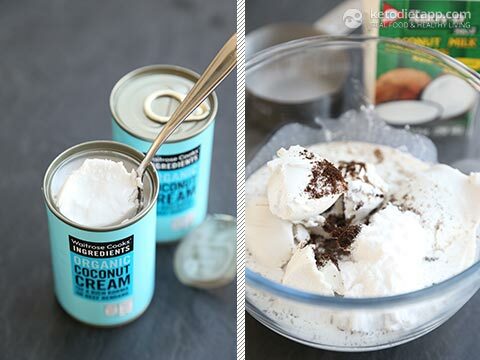 Spoon the coconut cream into a bowl. Add liquid coconut milk, powdered Erythritol, and vanilla. Using an electric mixer or a hand whisk, process until smooth and airy. Spoon the white layer equally in the 4 jars, on top of the red strawberry layer. Finally, top with fresh or frozen blueberries. Enjoy immediately or store in the fridge for up to 3 days. I saw this recipe and I was wondering if you could use just regular milk and if so what would you put in the place of the cream? Hi Crystal, regular milk is not suitable for a keto diet because it is relatively high in carbs. Instead I would use unsweetened almond or cashew milk. Instead of the coconut cream, the best substitute would be mascarpone cheese. You could even use sour cream or ricotta cheese - it depends on your preference. I hope this helps! This looks amazing! I just wondered if the calorie count is correct? It seems too good to be true! I just wanted to double check so that I don't overindulge with this one in my meal plan. Thanks!